Well I wasn't going to dive today, I got reports from 2 mates who dive late yesterday saying that the vis was getting bad, and there were no fish around. I had written off spearfishing and was about to climb into bed ..... it must have been almost 10 bells, when Robin gives me a shout and convinces me to go spearfish. We have this shallow ledge a couple km up the beach and even in low vis you can have a good dive. The draw card was that Rob was going to drive up through the sugar farm to the spot and we would not have to walk there. We got there before light, and the sea was looking real calm ... part of me would have liked to have taken my lighty surfing. Anyway we were about to get in when Rob mutters ... 'Wrong Freaking Key" He lock the car and took the gear lock key instead of the door key. I think we can all identify with the Kuk feeling that comes over you at this point. Never one to spoil a party Rob says "lets just dive" and the plan was that he would hit the beach early and run back to his house about 4km away and fetch a key. I was a terrible idea as there was no way either of us were going to get to work on time. But we dived any way! Getting beyond the back line I could sea the vis was marginal and with the sun not up yet I could not make out reef in only a few meters. When it got light the vis did improve but the Gorilla Snot was thick and reduced the vis considerably. A short while into the dive our luck started to change, a hear some one call and it was a mate of mine Scotty who offered us a lift back as he had brought his van down as well, and was fishing off his ski. My luck turned again and while on the bottom, tugging on the Ghost leader flasher a nice sized cuta came to have a look and I blasted him smack in the middle. The first thing that went through my mind was that Scott better come through with the lift coz carring this thing a couple km was going to a whole lot of fun! The east is going to blow so I dont know if the sea will improve ...probably not! So tomorrow will be a rest day!! Hey dont forget Salty Divers Club nite tomorrow at my place. I will be going through some Moz footage, and I will show the footage of this mornings cuta as well. The sea was looking good, but with no current the fish are fairly scarce. The strang thing is that the south winds have actually made the sea green when blowing for more than a day. I am not sure if it because they have not been real strong and arnt bring in the deep water, or if it is the water coming up from Durban side??? Strange thats another fish that has not been around in numbers ...the ol Snoek fish!! They made an early appearance and then seemed to disappear. Or is it that we are all just diving in the deep off there line?? Please dont forget that this Friday the 1st February is Salty Divers Club Nite. All are envited to come and join in. 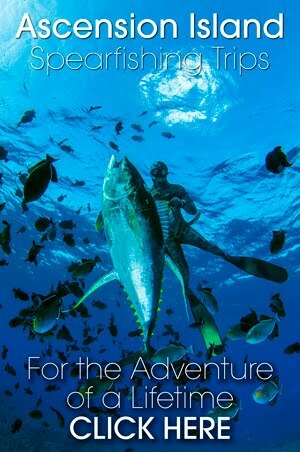 I will be showing some of our recent Mozambique spearfishing footage aswell, so it should be interesting!!! The past week or so has seen some pretty good spearfishing days, I have been so close to being part of it it freaks me out. I would here of fish being shot or good water, I would dive and see nothing or get in and the water had gone pair shaped only to be told that you should have been here ...... or there. We got in this morning and the water was ok getting a bit hazy on the sand. And it seems the cuta are hiding away for now, with only a few small dart cuta speared amongst a hoard of spearo's. To work on a Day like this? It a Fab morning, the sea is looking very inviting, although I am not to sure the water is crystal clean so I am not sure if any spearfishing will be going down. We have some southerlies the next 2 days with moderate winds so I am sure we will be getting in soon. The weekend was quiet with cooler water coming in. Friday was a good day with some ski boats getting there quota of fish. Thats a nice way of saying what I really want to say. This morning was a pearler, unfortunatly when my alarm went off this morning at 3:30 all I could think of was the mountain of work waiting for me at the office. The thought of snorkelitus and tiredness later in the day with the amount of work needed to be done was not not inviting. So I thought I would be a good chap and get to work early and Klaap the work. So just after 6 bells I get to work and guess what?? No freaking power!!!! I might as well have gone and dived and taken the morning easy. Any way I had 2hours to kill so I went past the spots and checked to see what came out. I was greeted by 13 cars of divers at Tiffs!!! Can you believe that?? I saw Guyla and he said it was quiet and he only saw a grunter, and as one of SA's best divers I know that if any one would see a fish it would probably be him. So even though the conditions were Epic I am kinda stoked that I did not dive in the crowds, I would have only got seriously frustrated and peeved. Lets hope LaMercy and Umlodti get clean and start to operate and take some of the pressure off the North coast. We were Spearfishing up at Cape Vidal 2 weeks ago, and it was dead quiet, and it was that way for days. Traditionally early the pace only picks up in February. So when I heard the boys were off to Vidal, my thoughts were that they were going to scratch for fish. I dont know about you but Spearfishing Vidal can be a serious hit or miss affair. Many of my best fish have come off Leven Point, but I have had just as many scratch dives there as well. For those that don't know, Leven Point is a 24km boat ride from the launch site ...... and most often in not so nice seas. So when you hit a blank ...... its a hard pill to swallow. Craig Harper made the long trip worth while with his 24kg Cuta shot off Blue Bush just south of Leven Point. Way to go Craig ...... I suppose that it going to be the cuta to beat this year!!! Some kids get amped to watch cartoons before school, not Braidy!! He seems to be living a life we all wished we could have. I remember only dreaming of surfing or diving before school, so it is super cool to be able to take him for quick ones before school. It does require something similar to a military operation, all the equipment organised the night before, and clothes and breakfast ready when we get back as the house turns to mayhem getting ready. This morning was a buzz though, with every one super stoked with Braidy's fish. After the conditions and fish being so good, I had to get Braidy in there. So we got down to Boulders in Ballito at first light, the wind had started to blow so I was a little hesitant. The water was a little green, not good for filming but good for a point dive. We headed out to the drop off on Lemon fish reef, but it was quiet. Time was running out so we headed in to the channel were the snoek also come through. And Bobs your Auntie .. a shoal of snoek come past Braiden. He sees them first and is already diving down when I see them swimming past. I manage to turn the camera on just in time to get the shot on film, his shot was a little high and the snoek spead off. Before the dive he was complaining that the fish he shoots dont run like the ones we shoot, well this one ran right out his hands!! I managed to catch the line coming past me and gave it back to him. I gave the fish another shot, but it was not all that good so the fish was still going wild. Braiden landed the fish all by himself as I was catching the action on film. Man I was so proud!! I can only imagine the stories going down at school right now!!! Cuta , Snoek and Good Weather. For once the weather and vis was good on the weekend, something that does not often come together. I heard of guys getting fish from Umlodti all the way past Zinkwazi. Some one on a Jetski lost a Marlin off Umlodti on Friday afteernoon and some good cuta came out as well. 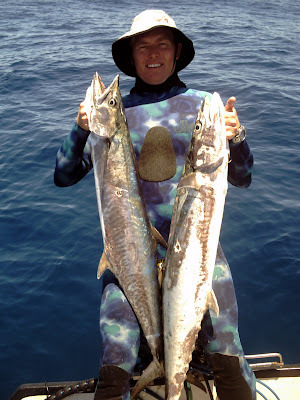 The who were spearfishing on also got good fish, buy most of the cuta were shoal sized. I heard one chap got a full quota of fish at the one spot!! I got a ride on a boat and went and did some exploring up north. We found some good reef with a ledge going from 15m to 18m, with some good cracks which looked perfect for Dagga when they are around. I managed to get a cuta of 13.3kg, but considering the amount of fish around we should have seen more fish. My mate Morne called me with an interesting story. He hooked up with another mate and Assassin of the Deep, Scotty. 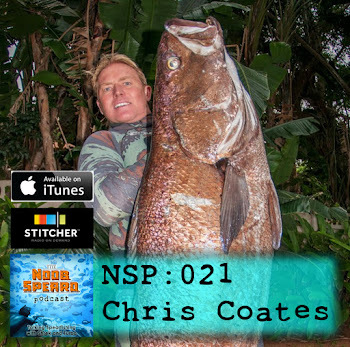 They hit one of the productive local spots and got into some snoek and cuta, only to have a hammerhead shark chomp down on one of Morne's snoek. But the story did not end there, some how the Hammer got caught up in Scotty's buoy line. You can only imagine the mayhem that pursued!!! Anyway Morne managed to subdue the shark by wrestling it by holding onto its head and putting its tail between its legs. After a bit of a tussle he was able to cut the shark free from the line and send it on its way. Man I would have dug to have got that on film!!! The east blew through Saturday evening and the swell had picked up a little so the sea was a bit of a mess on Sunday. Some guys still got in and some fish were still taken, but the conditions deteriorated quickly through the day. That afternoon an old mate Ant pitched up at my house, a little bummed he had missed all the action and persuaded me to go for a dive. I could see that the water was seriously green, but I had promised to take him diving some time and there were fish around. We hit a local spot and dived some shallow ledges in 10 to 15m. There was a terrible thermocline about 5m down and it was freezing on the bottom with only about 3-4m vis. But all was not lost, Ant landed a cuta that was swimming on top of the thermocline. It was his first cuta so it was a good dive in the end. We joked on the way home, that Braidy (my 10year old son) would not be able to tease him any more because he had not shot a cuta and he had. and Dad with two nice ones up in Mozambique. It looks like it will only get good again later in the week, so keep and eye out. The sea was nice and calm this morning, and I decided to take Braidy (my lighty) for a surf. There were some nice little waves at Surfers point and Braidy and I had a couple before I he had to get back home to get ready for school. I think back to when I was at school ..... I would have done anything to be able to surf before school. Any how the dive is still looking ok ...ish. The water was not too cold and the vis was more than diveable, but its not the warm clean stuff you are looking for this time of the year. Back diving in the home waters. Well I after not diving at home for a month, I got in at home for the first time. I have been diving in 26+ deg water with vis up to 30m. So when I got into the 6m 23deg water this morning it was a shock to the system. Although this is not uncommon for the conditions this time of the year, and normally I would be stoked. 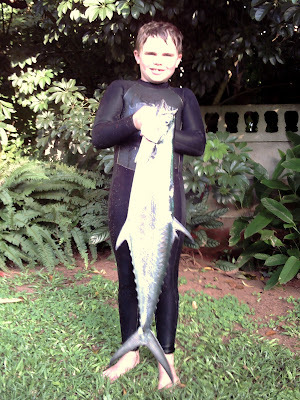 2 stock size cuta from our Mozam trip shot in epic conditions. Anyway the weather looks like it is going to hold out for a day or so, let see what happens with the water. Looking at the forecast the sea looks like it is going to be nice for the next couple of days. May I even go as far as to saw the week end even looks good. I have had a couple reports of good fish being caught off Umlodti / La Mercy area and some good water out deep. With a bit of luck the small west that is blowing will turn things on. It is interesting to note that in January 5 Salty Club records were broken last year. And a 4 more in February over the past few years. So we should be into some fish soon!! I am slowly getting back into the swing of things, Wayno is still up north at Sordwana and they got some fish yesterday. 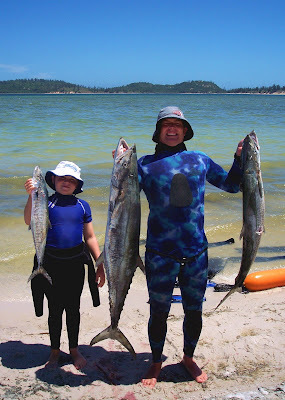 They did not get any 'special' fish but landed 3 cuta 2 kingfish and a nice sized Kakaap. Chatting to a mate he was saying that he finds the pre frontal pressure drop the key to Sordwana. Go add your ten cents worth. Howdy .... its been a while!! I am finally back at graft (work) and my spearfishing blogging should return to normal soon. I was away in Moz for a couple weeks, and dive flat out until we were pretty much dived out and worn out. We got loads of cuta, and got them on film aswell which was epic. We did not get any really big fish .... I did miss a Sailfish :-( but all the cuta were quality fish between the 8kg and 15kg mark. I will get some pics etc up soon .... just got to get my head around being back at work for now! !